now reading: Magazine Funding Skews Left. What Can Conservatives Do About It? Magazine Funding Skews Left. What Can Conservatives Do About It? Generally and increasingly, public-affairs media outlets are unable to turn a profit and survive in the marketplace. Much of journalism has become a nonprofit venture, and outlets must seek private funding, including from philanthropic foundations. In the case of ideologically oriented magazines and journals in particular, there is a clear funding imbalance, and conservative givers should consider what to do about it. In June, the Shorenstein Center on Media, Politics and Public Policy at the Harvard Kennedy School and Northeastern University’s School of Journalism co-published an interesting and comprehensive report, Funding the News: Foundations and Nonprofit Media. For the report, a team of four researchers studied 32,422 foundation grants to journalism and media-related nonprofit organizations between 2010 and 2015. They include awards to support “public” (as it’s still somehow considered) television and radio, magazines, national and local news-gathering operations, and university-based projects. Collectively, the grants totaled approximately $1.8 billion. Of this $80.1 million, about $25.6 million, or one-third, went to what the research team categorized as “general public affairs magazines” — with most of this, $23.7 million, going to one magazine, Harper’s. Another third ($29.3 million) went to ideologically oriented publications. The remaining third ($22.3 million) went to issue-specific periodicals in the areas of education, science and technology, or the environment and conservation. 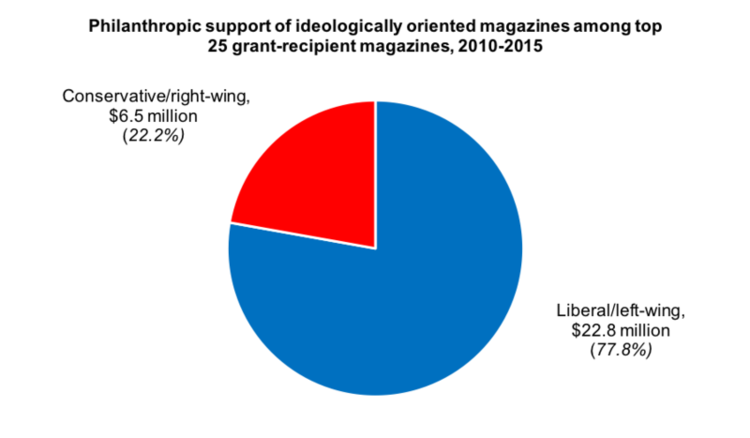 As shown in the chart below, of the $29.3 million that went to ideologically oriented magazines and journals, $22.8 million, or 77.8 percent, went to what the team considered “liberal/left-wing” ones; $6.5 million, or 22.2 percent, went to “conservative/right-wing” ones. That’s just more than a 3.5:1 ratio in favor of liberals. This imbalance should be unsurprising to conservatives, and perhaps especially so to fundraisers for conservative magazines. Nor should it be surprising to those in liberal nonprofits, which enjoy a similar skew in general. For a Capital Research Center study earlier this year, for example, Mike Watson and I found a 3.4:1 liberal-to-conservative advantage in the total revenues of traditional §501(c)(3) groups supported by six top liberal and six top conservative policy-oriented foundations in 2014. And according to underlying data compiled for a Manhattan Institute report last year, a closely similar 3.3:1 liberal-to-conservative ratio applied to the total spending of 28 top liberal and 24 top policy-oriented conservative foundations in 2014. On the shelves — and of course online — there were nine liberal magazines benefitting from the imbalance documented by the Shorenstein-Northeastern researchers. They are Mother Jones ($6.6 million), The Nation ($5.6 million), The American Prospect ($4.2 million), Washington Monthly ($2.4 million), Yes! Magazine ($1.2 million), Boston Review ($860,000), The Progressive ($670.000), Democracy ($570,000), and In These Times ($390,000). On the other side of the ratio were five conservative publications, led by The New Criterion ($2.5 million). developed a comprehensive, subtle view of the whole of the conservative enterprise. They understood it, and sought to promote it, on all its fronts, not just economic, but political, cultural, and moral as well. And in their humility, they were open to an extraordinarily wide range of projects that might conceivably benefit conservatism and the American republic. The rest of the small number of conservative magazines on the Shorenstein-Northeastern list are Commentary ($1.6 million), The American Spectator ($1.2 million), Reason ($690,000), and National Review ($270,000). It is not as if there are not enough nonprofit conservative periodicals to garner the amount of funding received by liberal publications. American Affairs, The American Conservative, City Journal, the Claremont Review of Books, First Things, Modern Age, National Affairs, The New Atlantis, and Public Discourse all fell outside the list of the top 25 recipients of foundation largesse. Still, as T.A. Frank notes in a lengthy Washington Post article, many of “these struggling, money-losing, quarrelsome, small-circulation constructions of pixels and paper do, sometimes, manage to affect the course of history. The Shorenstein-Northeastern research team did not ideologically categorize the top 25 magazine-supporting foundations during its studied period, but prominent liberal ones on the list include the Carnegie Corporation and the Hewlett, Ford, W. K. Kellogg, Surdna, Joyce, and MacArthur Foundations. The conservative ones are Bradley, Scaife, and Searle. “Serious conservative magazines will matter a lot, if we want them to,” Frank’s Post piece, almost tauntingly, concludes. That may remain an open question, if answered merely by the measure of comparative philanthropic investment. If existing conservative funders want them to, they hypothetically could “double down” on their support. This would mean less for other priorities. But the longer-term argument about the value of these magazines’ argumentation — both within conservatism itself and in dialogue with liberals — might not make the cut. Alternatively, conservative funders could try helping garner additional support from other, newer conservative funders. Some, including the Bradley Impact Fund and Donors Trust, among others, are doing just that. Fundraisers for the magazines, of course, have already been trying to do this. Otherwise, in the meantime and out of necessity, conservative magazines can continue to try doing more with less. They, like other conservative entities in many contexts, have done this for a long time, with some notable successes. Another option for conservative givers, of course, would be to simply cede the magazine field. This would be a mistake. The “opportunity costs” would be larger than those incurred by the magazines. The result would be a weaker conservatism — one less anchored in ideas and principles, not subjected to any internal or external challenge, and thus never forced to refine itself. This would present an even bigger, or exacerbate an already too-big, problem. As they have done before in the face of imbalanced resources, conservative givers should aggressively but prudentially look for ways to provide enough support for the pixels and paper that can help perfect the underlying principles of, and the policies for advancing, conservatism and the republic.